When Walrus escapes the zoo with his new friend Penguin, their adventures are twice the fun!In this sequel to the acclaimed Where's Walrus?, author Stephen Savage doubles the fun when Walrus escapes the zoo with his mischievous pal, Penguin. Will the zookeeper find them? Or will these clever runaways stay one step ahead disguised as subway riders, baseball players, and even grand opera performers? Hiding in plain sight, they elude the clueless zookeeper until a fly ball at a baseball game leads Walrus and Penguin to a chance encounter with surprising results! this is the follow-up book to Where's Walrus? and it has the same general shape - in a no-text picture book, animals escape from the zoo and blend into the city amongst humans in unexpectedly well-camouflaged ways while an increasingly frantic zookeeper (and the giggling reader) tries to find them. in the first book, the escapee was a lone walrus but here he contributes to the delinquency of a penguin and the pair have an extremely productive day that culminates in an unexpected event. (view sp this is the follow-up book to Where's Walrus? and it has the same general shape - in a no-text picture book, animals escape from the zoo and blend into the city amongst humans in unexpectedly well-camouflaged ways while an increasingly frantic zookeeper (and the giggling reader) tries to find them. in the first book, the escapee was a lone walrus but here he contributes to the delinquency of a penguin and the pair have an extremely productive day that culminates in an unexpected event. (view spoiler)[♥walrus nuptials♥!!! (hide spoiler)]the artwork is really cute, and it feels like it falls on the younger side of the picture book age range, even down to the safety scissors-rounded edges of the illustrations. it's sort of a pre-where's waldo book - the pages aren't cluttered enough to be challenging, but it's a fun way to train little eyes to look for the unexpected in picture books. overall, it's one of those picture books i liked, but it doesn't have that hard-to-define quality that's gonna make it live in my heart forever. which is fine - my heart's pretty crowded already. i was only medium on the first book, but when i saw this one at BEA i thought, "maybe it just needed a penguin to push it over the hump and into my heart." but nope! it's cute and i'm sure little kids'll love it to pieces, but i can only like, i cannot love. A no text picture book that will delight readers with it's hide and seek format. Walrus and his friend Penguin have escaped from the zoo and the zookeeper is hot on their trail to find them. The reader is in on the joke as the pair are hidden in plain sight. To me it is a continuation of the first book, 'Where's Walrus' which is a take on the Where's Waldo books.Wonderfully illustrated.Illustrated by Stephen Savage, published by Scholastic. I know it is hard to believe, but I like this one better then the original. Walrus's new adventure with penguin just leaves me wanting more. Savage sure has a way with art. May I give this a sixth star, please? Love this stylish collection of sight gags with a surprise ending that is so great a kid could have made it up. This fun wordless book doubles as a seek and find. Are you able to find Walrus and Penguin in every picture? Love, love, love. Made all my coworkers read it as assigned reading for the day. Fantastic wordless picture book with wonderful pictures. Kids will get a kick out of finding Walrus and Penguin (and the zookeeper!) on every page, and laughing at the animals' clever disguises. Liked this better than the first book. Visual Literacy- Wordless book #2I think the target audience for this book is Primary Grades K-3. I think younger children will love this story about animals, and enjoying trying to find walrus and penguin on each page of this book. And then will think it's so funny at the end when walrus gets married. They will just eat the whole thing up.This book is fantasy, because even if a walrus and a penguin escape from a zoo, they're not going to go play a game of baseball, and they're not going to driv Visual Literacy- Wordless book #2I think the target audience for this book is Primary Grades K-3. I think younger children will love this story about animals, and enjoying trying to find walrus and penguin on each page of this book. And then will think it's so funny at the end when walrus gets married. They will just eat the whole thing up.This book is fantasy, because even if a walrus and a penguin escape from a zoo, they're not going to go play a game of baseball, and they're not going to drive a car. So a lot of elements of this book are made up and could never really happen in real life. So it's fantasy fiction. CONNECTIONS:Text-Self: I connected this book to my preschool students, and how they love to laugh and point at all the silly things in books. While reading it, all I could think about was how "this student would laugh at this" and "he would think this was so funny". It brought a smile to my face to read, and think of how much my 3-year-old friends would love it. Text-text: This book reminded me so much of a book I LOVED as a child called The Escape of Marvin the Ape. In that book, Marvin the Ape also escapes from the Zoo and runs around the city doing things only people would do. The books are very similar in that they follow an animal who escapes the zoo and avoids the police doing human things and hiding in plain sight. Text-world: I would relate this book to the Henry Doorly Zoo, and ask my students about the animals in the book and how we've seen them in the real world at the Zoo. I would also ask them if this is something they could see happening if the animals escaped from the Zoo. (Also a stretch, but it's about two animals escaping from the Zoo and acting like people, it's the best I could do). Walrus goes on another walkabout from the zoo. This time he takes a penguin with him. The zookeeper hunts for the two animals, but they're very good at blending in. Unfortunately, Walrus gets injured at a baseball game.Fortunately, there's a very lovely female walrus nurse at the hospital.It's love at first sight and the book ends with a wedding (back at the zoo). Where's Walrus is a wonderful search and find book that can help teach children observation skills. Find the penguin and walrus in each illustration! Children will be excited to tell you the story in each 2 page spread. Lots of fun for ages 2 - 6. Not amazing but golly my 4 year old godson loved finding penguin and walrus and telling the story with me. As with all wordless stories, good for literacy development and imagination. Recommended ages 3-5. This book is pretty hilarious. Even though, at eight, my son is probably too old to be in the target audience for this wordless picture book, he still laughed every time he spotted the Walrus and Penguin. Cute wordless adventure between a zoo keeper trying to locate a missing walrus and penguin who go on many adventures. When Walrus and Penguin manage to escape from the zoo, they are in for a lot of fun adventure. Disguising themselves as a mother and a baby, ticket takers and newspaper sellers, a pigeon feeder and a pigeon, part of a crew on a rowboat, a taxi driver and passenger, the orchestra director and member of an opera, and players on a baseball team, they manage to avoid the zookeepers trying to catch them. When Walrus gets hit on the head and has to be taken to the hospital, however, Walrus finds someo When Walrus and Penguin manage to escape from the zoo, they are in for a lot of fun adventure. Disguising themselves as a mother and a baby, ticket takers and newspaper sellers, a pigeon feeder and a pigeon, part of a crew on a rowboat, a taxi driver and passenger, the orchestra director and member of an opera, and players on a baseball team, they manage to avoid the zookeepers trying to catch them. 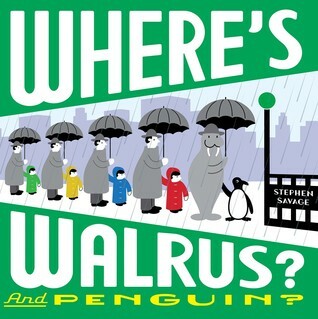 When Walrus gets hit on the head and has to be taken to the hospital, however, Walrus finds someone to be the love of his life.While there is no text in this book, young readers will enjoy following the story of Walrus and Penguin hiding in plain sight from the increasingly anxious zookeeper trying to find them and bring them back to the zoo. It is a little like a Where’s Waldo in a simpler way for younger children who might be frustrated with more complex search and find pictures. The artwork is cute, and its rounded edges makes it feel soft and pleasing for younger audiences. The marriage at the end is a little confusing, but overall the book is a cute one that will make readers smile as they follow the adventures of these two animals all over town. 4.5 out of 5 (rounded up)Walrus and Penguin snuck out of the zoo! Will the poor zookeeper be able to see through their disguises and bring them home? In this fun, colorful sequel to Where’s Walrus?, Walrus brings his friend Penguin with him for the adventure as they disguise themselves as opera singers, boaters, and baseball players. This is a wordless book, but the images are full of color and kids will have fun searching for Walrus, Penguin, and the zookeeper hidden on each page. While a book 4.5 out of 5 (rounded up)Walrus and Penguin snuck out of the zoo! Will the poor zookeeper be able to see through their disguises and bring them home? In this fun, colorful sequel to Where’s Walrus?, Walrus brings his friend Penguin with him for the adventure as they disguise themselves as opera singers, boaters, and baseball players. This is a wordless book, but the images are full of color and kids will have fun searching for Walrus, Penguin, and the zookeeper hidden on each page. While a book with no words may sound odd to someone who hasn’t read one before, they can actually be a fantastic way to teach early literacy skills! Wordless picture books allow parents and children to make up the story together and really engage with the story. Children learn to read from left to right, learn that stories have a beginning, a middle, and an end, and learn to use pictures as clues to what’s happening in the book. I love the clean, brightly colored illustrations, and had to smile at the surprise twist at the end. Children of all ages (and parents!) will have fun with this one! Although I see the appeal of books like this one for young readers since they need to look for the missing animals on each page and they develop visual acuity, the books never particularly appeal to me personally. I like them well enough, of course, just as I always enjoy wordless picture books. But I wish there were a little bit more or more of a challenge to this one. (I know that I'm in the minority here, and this book will be wildly popular.) That doesn't mean that I fail to find something w Although I see the appeal of books like this one for young readers since they need to look for the missing animals on each page and they develop visual acuity, the books never particularly appeal to me personally. I like them well enough, of course, just as I always enjoy wordless picture books. But I wish there were a little bit more or more of a challenge to this one. (I know that I'm in the minority here, and this book will be wildly popular.) That doesn't mean that I fail to find something worth noting in the digital illustrations because I do. A penguin and a walrus stroll right out of the zoo and into a lot of trouble. In various scenes readers will find them in a magazine kiosk and hawking newspapers on the street as well as conducting the orchestra and singing in the opera. A baseball mishap leads to a meeting that just might foretell a lifelong bond. Fans of these two adventurous animals will smile at how the story ends back at the zoo for a momentous occasion. Who knows where these animals will end up next? Savage’s sequel to “Where’s Walrus?’ is just as engaging and humorous as the original. Walrus, with new pal Penguin in tow, escapes the zoo one rainy day. The frantic zookeeper follows them on their gambol through the big city. By cleverly disguising themselves, Walrus and Penguin elude the zookeeper. They ride the subway and a limo, enjoy a row on the lake and take in an opera and a baseball game as part of their many adventures. It is at the baseball game that Walrus is injured and taken to th Savage’s sequel to “Where’s Walrus?’ is just as engaging and humorous as the original. Walrus, with new pal Penguin in tow, escapes the zoo one rainy day. The frantic zookeeper follows them on their gambol through the big city. By cleverly disguising themselves, Walrus and Penguin elude the zookeeper. They ride the subway and a limo, enjoy a row on the lake and take in an opera and a baseball game as part of their many adventures. It is at the baseball game that Walrus is injured and taken to the hospital where he is cared for by a comely walrus nurse. Walrus is immediately smitten and you can guess the rest. This wordless tale is engaging and witty on many levels. Pre-readers will enjoy following the animals’ antics through the uncluttered and subdued digital illustrations. The book is ideal for non-readers and for language development. It’s a smart, mischievous, and funny tale that is made even more so because it is wordless. It’s a must for any family with toddlers. September 2016 - the perfect, easy look-and-find for a beginner. Ben likes hunting for things in pictures, but isn't quite at Waldo level yet. This one is immediately gratifying and he found it very funny - he also immediately thought that the second walrus was the mom, so it turned into a twist ending for him! WHERE’S WALRUS? AND PENGUIN? by Stephen Savage is a follow-up to the popular Where’s Walrus (2011) picture book.This charming, wordless story takes zoo escapees Walrus and Penguin on an adventure through the city. All goes well until a baseball game and a trip to the hospital. Despite the accident, children will cheer the happy ending. Using simple shapes, basic colors, and interesting patterns, Savage is able to effectively hide Walrus and Penguin in plain sight. The pair use fascinating disgui WHERE’S WALRUS? AND PENGUIN? by Stephen Savage is a follow-up to the popular Where’s Walrus (2011) picture book.This charming, wordless story takes zoo escapees Walrus and Penguin on an adventure through the city. All goes well until a baseball game and a trip to the hospital. Despite the accident, children will cheer the happy ending. Using simple shapes, basic colors, and interesting patterns, Savage is able to effectively hide Walrus and Penguin in plain sight. The pair use fascinating disguises to avoid detection by the zookeeper. Children will enjoy finding the animals on each two-spread. Librarians will find a huge audience for this adorable series. It’s the perfect chance to bring out the flannel board and retell the story with other animals.To learn about the author/illustrator, go to http://www.stephensavage.net/.Published by Scholastic on August 25, 2015. I confess I didn't read the first Where's Walrus? yet. But it's a fun wordless searching book. Walrus and Penguin are on the lam, the zookeeper searching each double-page spread for both characters. It's a simple and fun dramatic irony making the find, knowing that the dumb zookeeper is being tricked. On each spread I had to look around to see not only how Walrus is being matched up to some other similar-looking figures, but also where Penguin is plugged in. The fun in this is that I got drawn i I confess I didn't read the first Where's Walrus? yet. But it's a fun wordless searching book. Walrus and Penguin are on the lam, the zookeeper searching each double-page spread for both characters. It's a simple and fun dramatic irony making the find, knowing that the dumb zookeeper is being tricked. On each spread I had to look around to see not only how Walrus is being matched up to some other similar-looking figures, but also where Penguin is plugged in. The fun in this is that I got drawn into looking all around the illustration. The ending was a little ridiculous, if sweet. I'd definitely want it in a stack of wordless picturebooks for an exploration of how this format works. PreK&upThis charming sequel to Where's Walrus continues the wordless antics of everyone's favorite escape artist as the Walrus again sneaks out of the zoo and goes on an adventurous romp around the city- this time accompanied by his sidekick Penguin. Savage's stylish retro illustrations are very appealing, as are the antics of the two friends as they attempt to hide from the persistent zoo-keeper. All ends well with a new addition to the team, a surprise wedding, and a return to familiar gro PreK&upThis charming sequel to Where's Walrus continues the wordless antics of everyone's favorite escape artist as the Walrus again sneaks out of the zoo and goes on an adventurous romp around the city- this time accompanied by his sidekick Penguin. Savage's stylish retro illustrations are very appealing, as are the antics of the two friends as they attempt to hide from the persistent zoo-keeper. All ends well with a new addition to the team, a surprise wedding, and a return to familiar grounds as (presumably) Walrus and Penguin happily settle down now that their wanderlust has been appeased- at least until the next book comes out!This book was obtained at BEA15 in exchange for an honest review.